KOKOMO, Ind. 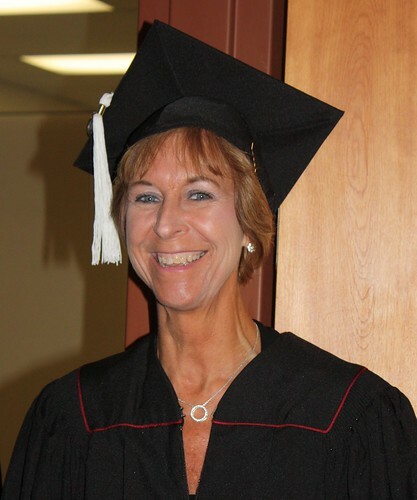 — When Cathy Archer began work on her degree in general studies at Indiana University Kokomo, she bought two ornate diploma frames and hung them in her office, as a reminder of her goal to earn an associate degree, and then a bachelor's degree. Cathy ArcherMonday, October 15, she realized her dream, receiving her bachelor's degree. Friends, family, and campus leaders in full academic regalia packed the small dining room for the ceremony at Fairmount Rehabilitation Center, where she was being cared for in the final days of her battle with Creutzfeldt-Jakob disease. Hours later, Archer died, leading friends to believe she was just holding on to fill her empty diploma frame, after five years of hard work and study. Archer, 56, who also was an administrative secretary in the School of Humanities and Social Sciences, expected to complete her degree in August. However, in late spring she began experiencing short-term memory loss and dizziness. Doctors initially suspected she'd had a stroke, but as her health continued to decline, they continued testing. In late summer, she was diagnosed with Creutzfeldt-Jakob disease, a rare, degenerative, fatal brain disease. It affects about one in one million people worldwide, with about 200 cases per year in the United States. Monday, she attended the ceremony in a cap and gown, seated in a wheelchair with her husband, Chester "Archie" Archer Jr., by her side, holding her hand. He occasionally leaned in close to whisper comments to her. "I appreciate everyone at IU Kokomo doing this for her," he said. "It's overwhelming." Sciame-Giesecke reminded those attending that Monday's degree conferral was a joyous and long-awaited day for their friend. "I am going to be positive and upbeat. This is a day of celebration for Cathy. She has been working on this degree for a long time," she said. She recounted Archer's many accomplishments, both on campus and in the community. She had received the 2004 Virgil Hunt award for service, and also was the outstanding general studies student in 2010, when she earned her associate degree. She was president of the staff council, coordinator of the annual craft show, was a member of Altrusa, and participated in Relay for Life. "Only Cathy Archer, with all her energy and drive, could have accomplished so much while working two jobs and volunteering extensively in the community," Sciame-Giesecke said. She also noted that Archer's degree is the first from the new School of Sciences. Friends and family shared stories about Archer, talking about her "Cathy-isms," where she made familiar phrases into her own funny jokes, her enjoyment of her music classes, her caring for others by offering treats and snacks, and her enthusiasm for her classes. JL Murdoch said Archer was in the first class she taught at IU Kokomo, an oral interpretation class. She remembered that students were doing dramatic readings and could bring pieces of costumes to suggest a character, but were not required to be in full costume. "Cathy came to class dressed head to toe as a nun," she said. "That is how committed she was to doing her best in class. This degree conferral is a wonderful thing for her."